This project aims to produce short radio/podcast documentaries to illustrate how women undergraduates and graduates were prominent in the history of NUI Galway at a time of social and political change during the late 19th and early 20th centuries. It will show how their intellectual and social effort made an impact locally and further afield, while demonstrating the value of constructing life-stories as a way of understanding and interpreting the past. The project makes innovative use of accessible technology, and will use archival resources and a creative style of presentation. Sharing the podcasts online, as well as via radio, will enrich the story of NUI Galway, and introduce local and international audiences to a fascinating dimension of the university’s history. The Explore project has gathered information about Emily Anderson, the first of three life-stories to be submitted for the project. Emily Anderson (1891-1962) studied languages as an undergraduate in Galway, later undertaking postgraduate studies in Germany and teaching in Barbados. In 1917, she returned to Galway where she was the first lecturer and woman to hold the newly established chair of German. In 1920, Anderson left Ireland for London, working for the Foreign Office (and the War Office during the Second World War) until 1951. Emily Anderson achieved international prominence in the sphere of translation and music, notably in translating the letters of Mozart and Beethoven. The podcast will situate Anderson’s life in relevant historical contexts, using research, interview and sound. Interview: we have spoken to a local researcher, with a background in German and research on Anderson. We aim to record and produce our podcasts using the Flirt FM studio facilities. We’re organising an event relating to the Explore project in the library for the month of March. We have selected a number of focus individuals who have publications in the library and will organise an exhibition of same in the library foyer (inside the library). The library will provide the glass cases and the stands. We hope to have it in place for International Women’s Day on 8 March. We held a meeting on Friday, 1 April, re planning. We have most of the written research completed on the three women in question. We also plan a visit to Dublin archives on Monday, 18 April and aim to have all materials ready to tape in the studio (as required) for the end of April. The associated exhibition in the library – Past Lives (combining names from the current project and some from the previous Digital Memories) – is extended for the month of April and is receiving good reviews. The Explore logo is attached and the six biographies are translated into Irish. The exhibition is also publicised on the library blog and on screen in the library foyer area. This project focuses on connecting second level students to the archival material, primary sources, and collections of the Hardiman Library at NUI Galway. Students will engage with varying media of primary sources, from historic objects to digital sources and in particular their unique potential for experiential learning. Key outcomes for students include the development of critical analysis skills, independent thinking and historical research skills. Currently, no direct structured engagement between school groups and the archival collections of the James Hardiman Library exists. This project will provide access to archival material from the student’s own locality, the West of Ireland, in a national context. A particularly innovative aspect of the project is the offering of audio-visual source materials for students with learning difficulties. The development of a digital access platform for archival material for classroom-based learning will support on-going engagement. This initiative will offer a tangible, innovative and engaging learning experience for students to the history of the West of Ireland and wider national cultural history with a focus on NUI Galway as the gateway to their future learning. This project aims to develop a website to facilitate language learning exchanges at NUI Galway. The website will enable students (staff) to search for other students who speak different languages and arrange meetings/practice groups in order to improve their language skills. NUI Galway has a large number of international students for whom English is not their first language. However, it can be challenging for these students to improve their English skills because they may not have a close relationship with native speakers. At the same time, many native English speakers want to learn a new language, but they don’t have anyone to practice with. This project will not only help international and Irish students to learn a new language, but also support international students to integrate and make friends. This project will facilitate students to teach clients of Simon Community Galway how to repurpose/recycle/reuse materials in a sustainable manner in order to create vertical gardens. Operating as a social enterprise, the project will run three separate week-long crash courses with the aim of empowering people through skills development and engagement with the university community. The output of the project will be a vertical garden kit using recycled materials (such as vinyl) as the base. In addition, the kit will contain seeds and soil. With 66% of the world’s population said to be living in highly populated urban areas by 2050 (UN, 2014), urbanisation and lack of green space is an ever growing problem. Vertical gardens surmount the issue of lack of space for a garden and are a beautiful addition to indoor or outdoor wall space. As well as this, they support recycling and facilitate the health benefits associated with plants and gardening. This project will mark the quartercentennary of Shakespeare’s death in 2016 within NUI Galway and Galway City. All around the world, cultural, creative, and educational organisations are preparing a wide variety of activities to commemorate this momentous year. A connective series of 4-6 public art campaigns will run from January to June of 2016, and will draw on guerrilla art aesthetics and marketing techniques to promote Shakespeare in unanticipated ways and in surprising venues. The series of guerrilla art http://guerilla-art.wikidot.com/what-is-guerilla-art projects may include: decorating public spaces (using non-permanent methods in consultation with relevant stakeholders); running a mail art project; leaving ‘branded’ objects in public venues; inserting Shakespearean messages in library books; and holding a community birthday party for Shakespeare on 23 April 2016 (World Book Day as well as Shakespeare’s birth/death date). Shakespeare in Galway 2016 is continuing apace! We have chosen our beautiful logo, which can be seen on our project webpage and will be seen all over our campaign materials over the next few months. We also have a Twitter account — search for @shakingalway — and a Facebook page, too. The team have convened for two very productive meetings, in which sub-committees were established and ideas were bashed out. Look forward to surprise performances, travelling Shakespeare editions, a recreation of Juliet’s wall, films, and a lovely birthday party over the next few months! The first major campaign is Valentine’s Day, where we hope to recreate Juliet’s wall, and to invite NUIG staff, students, and Galwegians alike to be creative and write their own love notes on her wall. You might find a few sonnets and love quotes travelling around campus and town, as well. All in all, it’s shaping up to be a very fun project, and we’re all excited to see where SIG2016 takes us. This project will focus on creating an event on the theme of vision and perception inspired by the 2015 International Year of Light. It will involve student participation in projects related to how we see the world around us. A flagship activity will be undertaken using Enchroma colour blindness glasses to generate images/video showing how the colour-blind see the world and allow the colour-blind to experience full colour. This project enables students to come forward with their own interpretations of perception which shows how various people think differently and see the world in a different way. The investigation of colour-blindness and showing people what the colour-blind see is very relevant as 8% of men have colour-blindness in Ireland, and it is a misunderstood and fascinating condition. – The “Seeing the Light” Project in association with Neurosoc, has acquired 500 euro of additional funding from the Bank Of Ireland Bursary. – A preliminary date for the event has been selected as Tuesday March 15th, to coincide with the on-campus presence at Brain Awareness Week. Upstairs in the Aula Maxima has been booked for the entire day. – Following the reconvening of Neurosoc this week, full-scale advertising of the event both inside and outside the University will continue, with the aim of attracting further participants to the project and advertising it to the outside community. The Galway Neuroscience Centre has also agreed to advertise the event to schools attending their event (5 transition year classes throughout the day). – Several different groups have been formed so far, each exploring a different perspective on the topic of Perception: Colourblindness Computer Simulation, Enchroma Colourblindness Glasses and their effect, Galway Night Sky Explore Group, Racial Boundaries (Human Rights link) , and Poetry (creative writing). This project aims to determine the knowledge, attitudes and behaviours of students at NUI Galway in relation to skin cancer prevention and to disseminate the findings widely on campus and nationally. Over the past three decades, more people have had skin cancer than all other cancers combined. In fact, one person dies of melanoma every hour. A survey will be used to assess: What do students in NUI Galway know about skin cancer? Do they think it is important? What are they doing that puts them at risk? This research study could form the basis of a future skin cancer awareness campaign that specifically targets gaps in knowledge, misconceptions and attitudes that put students in Ireland at risk for skin cancer. This campaign could run in NUI Galway and then continue at a national level. Created a questionnaire based on other previously published surveys. This project will expose interested Physics secondary school students to electronics, photonics and robotics in an interactive and fun way. This will be achieved by building Pi-Bots https://www.kickstarter.com/projects/1158090852/pi-bot-the-next-great-tool-in-robotics-learning-pl (Arduino robot kits) at workshops on and off campus, and showcasing them at NUI Galway open days. This type of interactive learning develops problem solving, leadership and technical skills. What a fantastic vehicle for learning! This project moves away from the traditional passive learning strategies to a modern goal-driven interactive didactic framework that is interdisciplinary in nature. The Pi-Bots come in complete kits and are accompanied by online tutorials, materials and videos to support the students if they encounter difficulties. The Pi Bot project has been delayed as the first bot is still in transit from California. Proactive engagement of potential partners is still ongoing. The most exciting potential collaborators are Entrepreneurship Soc, Computer Soc, and the new MakerSpace in the library. The MakerSpace could form a hub of activity as it has the facilities to host and create pi bots. These include 3-D printers, raspberry pi and electronic components. The project will accelerate once the first bot arrives. This project aims to develop a buddy programme to ease the transition for incoming international students and ultimately enhance their academic and personal experience at NUI Galway. The objective is to pair up international students with an NUI Galway student who will contact them before they arrive to answer questions. When the international student arrives their buddy will help them find textbooks, show them around campus and town, and provide on-going support. The project will be open to all incoming international exchange students and new degree seeking international students. The goal is to put an Irish spin on an already successful idea and implement it on campus. NUIGlobal Buddy Programme hopes to bridge the social gap between Irish and international students to ensure that students from different countries/cultures feel more integrated. Diversity provides the opportunity for rich social learning. Our project so far is going very well. At the beginning of the semester students were matched and it has been very successful. Everyone has contacted their buddy and many have fostered friendships. I’ve met a few of the Erasmus students myself and they are enthusiastic about the project. Once we get our funds we can have our event and meet everyone involved face-to-face. The goal of this project is to improve the quality of photographs used in NUI Galway publications, press releases and on the website by running training courses for amateur staff photographers. College websites, in particular, often feature stale stock photography, which is a pity in such a photogenic campus. A series of training workshops will be run to give amateur staff photographers a grounding in both technical skills and creative composition. Process and terminology will be demystified to give staff the confidence and skills to take a good photo. 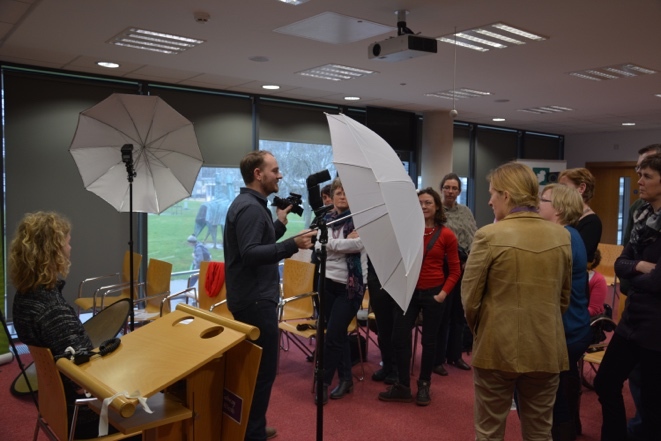 The project team aim to work with the Marketing Office to produce a short pack – online, but in a printable PDF – that will cover the basics of photography and also tips on how to showcase NUI Galway events creatively. This would also include guidelines (correct dimensions for College webpage banners, for example) on how to process imagery for use on the web and for print. The first workshop on Friday, 15 January 2016 will be a hands-on guide to your camera’s modes and settings. We’ll cover the basics in a fun, lecture-light environment and take practice photos along the way. 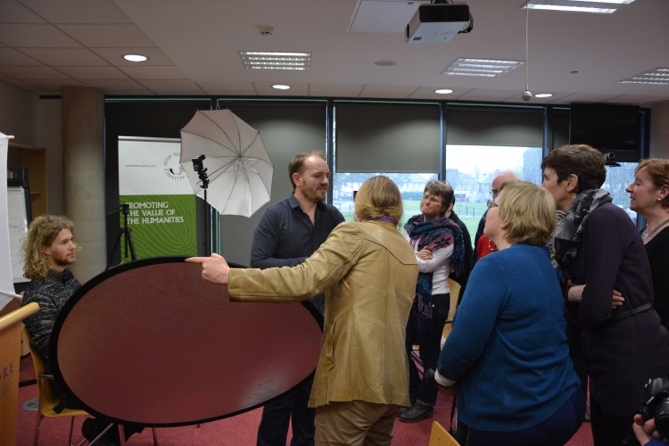 The second workshop on Friday, 12 February will focus on event photography and using a flash. NUIG staff are regularly asked to provide images for promotional purposes, internal publications and the web. This workshop will help staff take better quality, more interesting photos of guest speakers and formal portrait shots. The third workshop on Friday, 4 March will be (weather permitting) a photo walk around our beautiful campus. We’ll help you replace stale stock photography on the web or bland handbook covers. All workshops take place in THB-G010 Moore Institute Seminar Room, James Hardiman Building. Registration is via an EventBrite link circulated via staff email in the new year. Since the introductory meeting in November, we’ve been quite busy. The Moore Institute Seminar Room in the James Hardiman Building was booked for the workshops and an EventBrite page was set up for event management. We circulated information for these three dates via a mailing list that Valerie Leahy maintained for the ‘Capture your Campus’ project and via John Caulfield in the Marketing Office, who included our workshops under the ‘Staff Benefit of the Week’ in the Dialann email of 8 January. We reached our capacity of 40 (and filled a waiting list) rapidly, with 318 visits to our EventBrite page to date. In advance of the workshop, PhotoSoc prepared PowerPoint slides while handouts were designed and printed by PrintThat. The first workshop took place on Friday, 15 January. 40 members of staff from a wide range of schools and disciplines attended the workshop, which was presented by Bjorn Carlsson and Michael Gibbons from PhotoSoc. This took the form of a hands-on guide to camera modes and settings, with frequent exercises and a question-and-answer period at the end. Feedback has been extremely positive. We are now working on preparing material for the second workshop, which is already nearly booked out. We are also amending the plan for the third workshop, a photo walk around campus, to include Sharon Flynn’s suggestion whereby photographs of the campus are uploaded to Wikimedia Commons. Since the previous project update, we’ve run our second workshop on Friday, 12 February. This was presented by Bjorn Carlsson from PhotoSoc with a guest professional photographer, Tom Flanagan. The theme of this workshop was event photography, particularly with the use of flash guns. Few members of staff had first-hand experience of using professional flash setups and it surprised many that the equipment required was relatively affordable and easy to setup. Participants used flashguns and softbox umbrellas provided by PhotoSoc, and discovered the effects of multiple flashes, the positioning and power settings of off-camera flashes. They also learnt about the impact of light and shadow on portrait photography in particular. We’re currently preparing handouts for the third workshop this coming Friday, March 4. It’s a different format to previous workshops where participants will take a photo walk around the south campus taking architectural shots of the Quadrangle and other buildings, panoramas and nature shots along the river. The handouts will contain instructions for staff on how they can join PhotoSoc, an invitation to submit photos to the previous EXPLORE project ‘Capture your Campus’ and a guide on how to upload photographs of the campus to Wikimedia Commons (which currently has only 30 photographs of the entire campus).